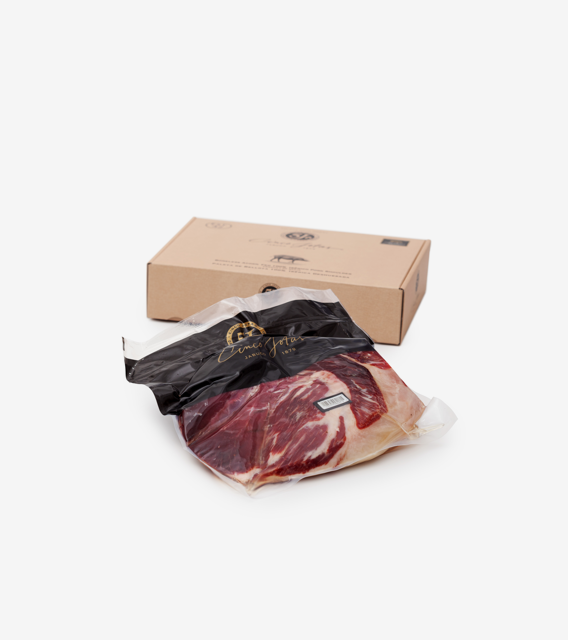 Enjoy three to four pounds (variable) of a premium whole boneless Iberian jamón. 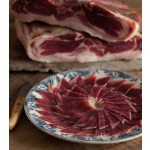 This cut is from the shoulder of the pata negra pig, who has spent his days roaming free range, eating a diet of acorns (bellotas), and transforming their meat into a healthy, delicious ham. Carefully cured and salted by artisans passionate about their trade, this jamón is ready to be sliced and enjoyed for many months ahead. Iberian ham has countless health benefits, and is truly one of life's greatest culinary pleasures. If you think there are only four flavors – sweet, salty, bitter and sour – have a re-think! The fifth flavor, called umami, translates literally from Japanese as “pleasant, savory taste” or “yummy”. Umami is the indescribable sensation responsible for exalting your taste buds in a select few foods. The umami flavor comes from amino acids, which can be naturally found in some food protein. One of them is the unmistakable multi-sensory experience of acorn-fed Iberian ham. This revered product of Spanish cuisine has more protein than fresh pork - on average about 50% more - and has been shown in numerous studies to be part of a healthy, nutritious diet. In 100 g of ham, there are about 33% of the proteins we need for our day. It is for this reason that Iberian ham is of great interest for those eager to maintain high-protein diets. This exquisite bellota ham is also very rich in calcium and phosphorus, as well as containing vitamins B1, B2, and iron. Enjoy it in good health! 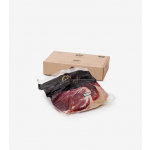 A boneless Iberian ham should be kept refrigerated, unlike bone-in ham, because once the bone is removed the curing process stops so there is no longer that natural preservation. Be sure to put the block of ham on a plate to collect the oil during storage. Divide the boneless ham into large pieces, with a sharp knife. An electric slider is also recommended. Cut only as much as you will eat, as nothing is better than a ham sliced just moments before you enjoy it. Arrange the slices of ham on a warmed plate on their own, or combine with other ingredience to creat a culinary delight. Using your fingers to eat your food? With Iberian ham, not only is this allowed, but it's encouraged! Enjoy the full experience. There are no formal rules for pairing your Iberian ham, but we can offer some general guidelines to help. The basic pairing principle is this: wine should reestablish the balance in the tastes. Aged red wines or white wines with low acidity are good pairings for acorn-fed Iberian ham. A nice recipe to try is the refreshing cream of pumpkin soup with small cubes of Cinco Jotas ham. However, if you'd like to keep it simple (and authentic! ), why not just enjoy translucent slices of fine Iberian ham elegantly displayed on a warm plate for a genuine gourmet treat. All Cinco Jotas products comply with the strictest import regulations, food safety standards, and certification requirements. The very name of Jabugo immediately brings to mind the flavor and aroma of the best ham you can buy. Located in the heart of the Sierra de Aracena and Picos de Aroche mountains, declared a Biosphere Reserve by UNESCO, Jabugo has been famous since the Middle Ages for the art of producing the best acorn-fed 100% Iberian jamón in the world.